959s have been front and center in the Porsche world as of late due to some incredibly high priced sales for extremely nice examples (Porsche 959 Vorserie, 959 Prototype, 959 Komfort) . This post is not about one of those. Listed for sale on Craigslist (where else?) 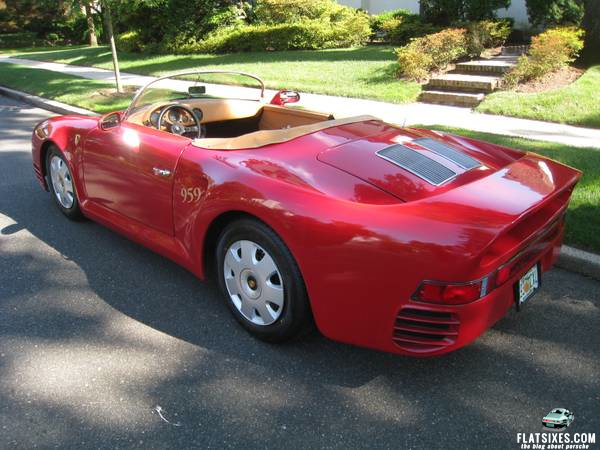 is this 1986 Porsche 959 Roadster Convertible Replica. Looking past the fact that Porsche never made a 959 Convertible to replicate, what exactly is this (it sure as hell isn't done like this 959 speedster)? It doesn't appear to be built on a Porsche chassis of any type and the seller doesn't provide any real information other than the fact that it has a new clutch, new tires and the engine "was just completely rebuilt to a 1860cc". What is apparent from the pictures is that this car has what appears to be VW hubcaps and the numbers 959 near the rear scoops to help identify it (as you might have a hard time otherwise). It kind of reminded me of this old art project. UPDATE: One of our resident experts identified this package as the "359 kit" Basically, it's a VW floorpan with the middle styled like a 356 Speedster and the front and rear of a 959. That would explain why it looks so wrong. Evidently, there are a number of these around and a small, but thriving, market for those who enjoy them. Looks like a 356 replica with a 959 replica bodykit on top. Replica built out of a replica – nice. That car gives 356 or other replicas a bad name. It’s just wrong all over.